**My Desert Cottage**: Guest Blogger at F.P.T.F.Y. 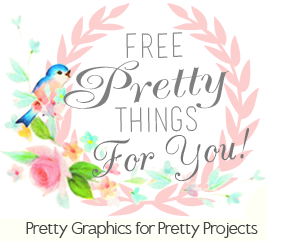 The very sweet Keren Dukes from Free Pretty Things for You, asked me to be a guest blogger! This was a first for me and I has very happy to do it. It's always wonderful to be introduced to a whole new set of Bloggers. I concentrated the post on a few tips to help with Blogger blogs, so please pop over to Keren's blog and check out the post and all the wonderful goodies that she has to offer as well. So back to why I have been away. It's really no excuse, but I have been on a journey of sorts. (Trust me, it has not been a fun one!) Since I started Valentine Design people have been asking me if I do Wordpress blogs. I have always had to say no, but I felt like it was time to change that. I have been spending everyday with my nose stuck in a book or at the computer trying to figure that thing out!! Oh my gosh! I think I have aged 10 years and lost half my hair!!!! (It feels like I should have anyway) Wordpress is a whole other animal from Blogger and I still have a looong way to go before I'm ready to add that to my list of services. I just wanted to let you know what I have been up to, and I hope you will stick with me while my posts are a little more sporadic than usual! You have my admiration when it comes to creating the blogs that you do. I have enough trouble with mine getting it to do what I want it to! You can create blogs from nothing, and now you're looking at wordpress blogs too. You must be very clever. I miss you when you're gone but always glad to see your posts. Gee, I wonder why a song hasn't been written about that. Good luck with Wordpress..I admire your initiative..I say "If it ain't broke, don't fix it." Have a great weekend.. Very informative guest post Karen, and I didn't know about the dot com thing - we may have to talk! A number of bloggers have moved to Wordpress and as you say, it operates differently but has some advantages over Blogger. I guess you'll be sharing the pros and cons in a post once you have it all figured out. Well, I have no doubt you will be up and running with WordPress in the days ahead. Now, I'm off to read your guest entry...........Happy New Year Friend! Happy New Year Karen. This has been a crazy busy new year for me. At least we've been having great weather! Hope to catch up with you soon.